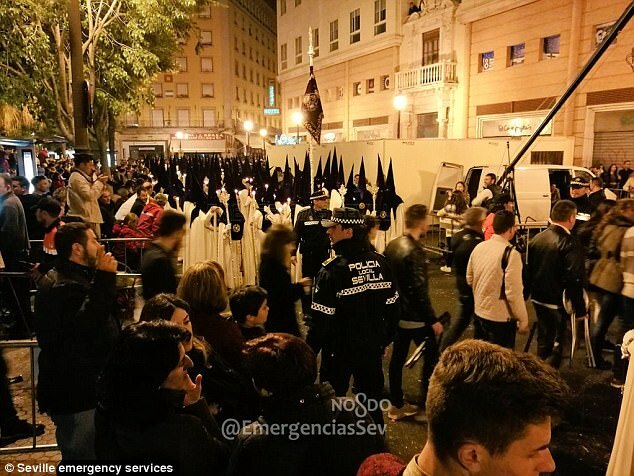 Spain: Muslims Storm Seville Good Friday Parade Screaming ‘Allahu-Akhbar’. 17 Hospitalised. 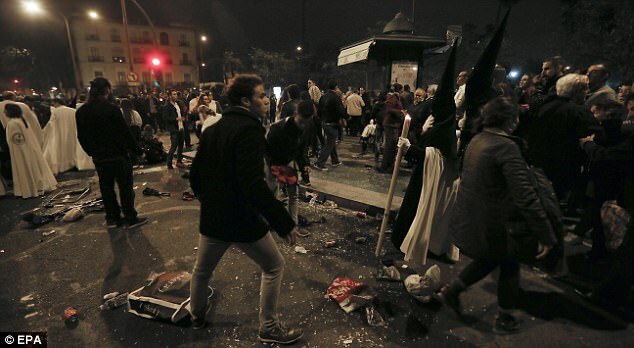 pennine: I haven’t heard anything concerning this unrest in Spain here in UK. Although it might have been reported on television (which i don’t own/watch anymore) or may have been mentioned on a radio station i’ve not been tuned into. Nor is it known by me whether the rioters are jihaddies. But one thing i feel is safe to say, is that: had this been a harmless traditional Islamic festival carried out by peaceful law-abiding Muslim citizens trashed by the kuffar of any country in the world, and especially so if the mad-dog rioters had been screaming “Jesus Christ is Great.” or Jewish people with “Praise be to Hashem.” I’d be in no doubt that it had been broadcasted led by the BBC.It would have been headlines !!! Courtesy of The Muslim Issue & Gerard Couzens and Rita Sobot For Mailonline, Et-Al. Muslims will re-inliven ETA and make their jihad cause intertwined with ETA in pretence for ‘independence’. Whenever a country brings in Muslim migrants, and Sunni Muslims in particular who are responsible for 98% of islamic terrorism, they encounter a future with constant political turmoil, riots and efforts to undermine the government by hiding behind the scenes while holding the threads to conflicts. 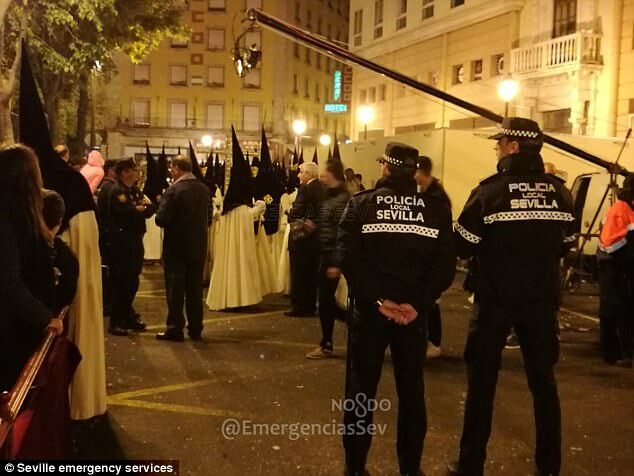 Spanish people are in denial how focused and determined Muslims are to take back Andalusia. They will populate there and multiply until locals move out. And from there it gets only worse. Yobs accused of starting stampedes at a Good Friday procession sparked panic among people by shouting ‘Allah is Great’, it emerged today. Seven locals aged between 19 and 47 were held along with a Senegalese national. Some have been described as well-known criminals. Police are analysing social media for any evidence the suspects, who were arrested at different times in the early hours of yesterday morning/Friday morning, coordinated their actions. 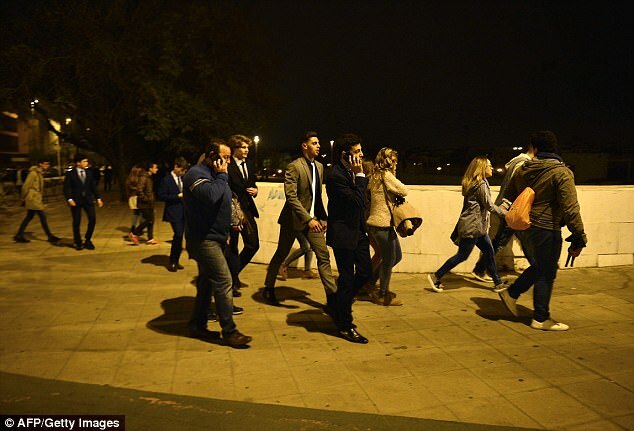 A video on Twitter showed the disturbing scenes as people ran for safety. It is believed there could have been four different incidents which somehow led to mass panic and a stampede in which people were knocked to the ground and trodden on. A similar incident happened in the year 2000. 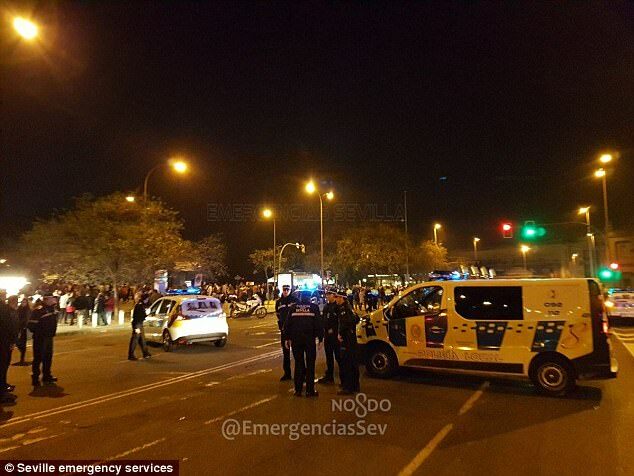 The incident in Seville follows a similar scare in Marbella where a fight is believed to have led to a terrorist scare during the religious celebrations. 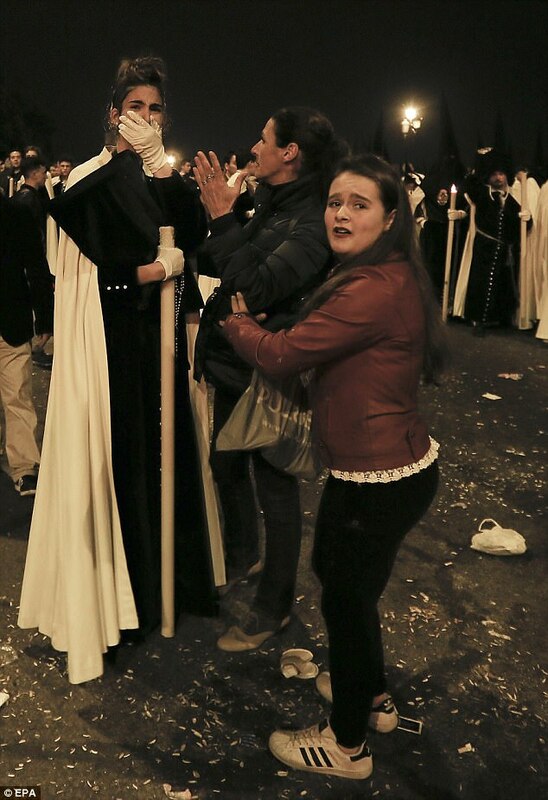 Holy Week in Seville attracts hundreds of thousands of people, including tourists from around the world. 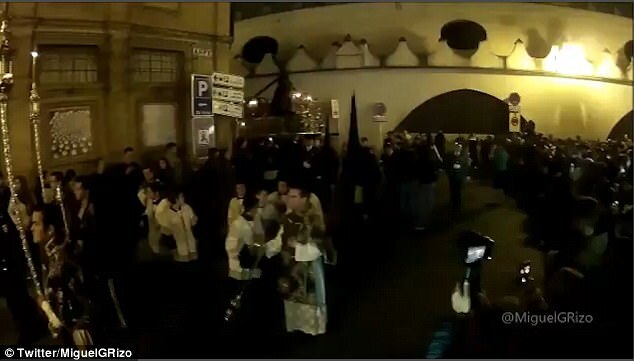 The Easter processions began at midnight but the disturbances first broke out near a bridge at around 4am today. Police believe it could have been an orchestrated attempt to maliciously provoke a stampede. As in the Marbella incident, many people thought it was a terrorist attack with a lorry aiming at the crowds which was not the case. 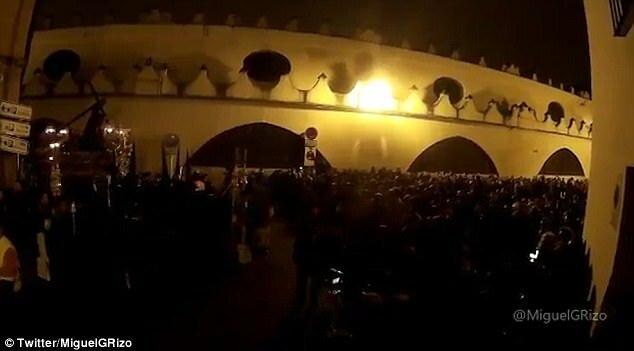 However, the rumours, together with shouting, public disorder and threats, caused the crowd to run away and create a major problem for organisers who tried to calm the situation. A police spokesman last night said they were looking at images of the parade but at this stage felt there was no connection between the ‘isolated’ four incidents. ‘It is believed to be hooliganism and vandalism,’ said a spokesman. The National Police have asked spectators who took videos on their phones to hand them in as evidence, with anonymity guaranteed. A number of musical groups were unable to continue in the parade because of injuries received and damages to their instruments. 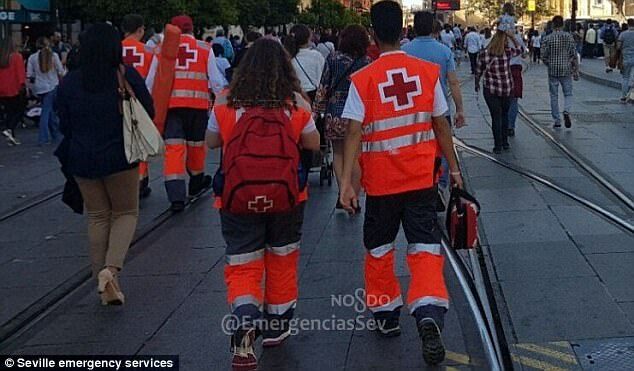 Yesterday morning, the Seville emergency services issued a statement which said: ‘From the outset, the police and health care system focused on trying to spread calm and control the situation while trying to identify the causes of what happened,’ they said. ‘Three of the detainees who were shouting and beating are common criminals. One of them has had 36 arrests. The local council has praised the emergency services for its good work during the night in bringing calm back to the city and avoiding a tragedy.